Steinbeck might be said to have rescued biology from the laboratory and put it on the layman's reading shelf. 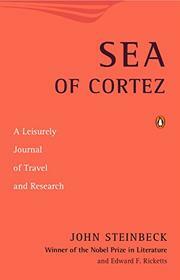 This is an unexpectedly readable record of a scientific research trip, taken by the co-authors in a sardine boat down through the Gulf of California, collecting specimens of deep sea and off shore life, examining them, reporting on their significance to biology, and philosophizing on their significance to man. Parts of the text are a bit beyond the average reader; much of even the science comes to life under Steinbeck's touch. One shares intimately the experiences, the things they see and do, the people they encounter. Typically Steinbeck in the digressions on humanity and world chaos. Not likely to add to Steinbeck fans, but will pick up plus market on dual appeal.